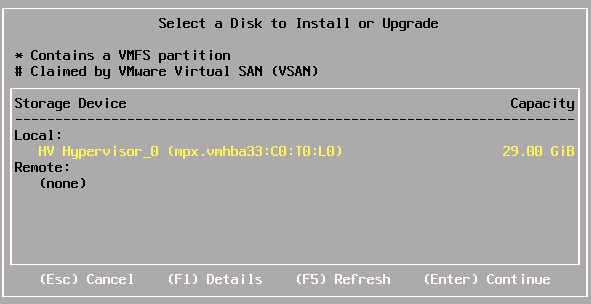 I’m trying to install VMware vSphere ESXi 5.5 on Cisco UCS C220 M3 server. The local storage is Cisco Flexible Flash (FlexFlash) internal 32GB SD Card. Please refer to ‘Cisco FlexFlash: Use and Manage Cisco Flexible Flash Internal SD Card for Cisco UCS C-Series Standalone Rack Servers’ for details how to configure and use internal SD cards. partedUtil failed with message: Error: Can’t have a a partition outside the disk! 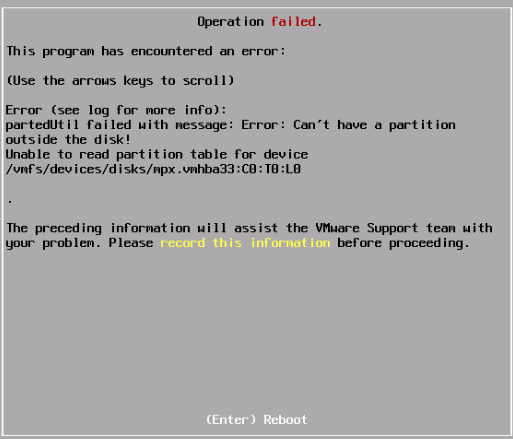 VMware Knowledge Base Article “Formatting LUN as VMFS 5 fails with the error: Can’t have a partition outside the disk! (2082806)” suggests that the Device/LUN already has a partition configured. To resolve this issue, you need to create a normal MS-DOS partition (I guess ANY partition that can be deleted by the Installer) on the affected disks using partedUtil utility. There is no need to map/attach the LUN/SD to another host, you can press ALT-F1, open the DCUI and run partedUtil utility. Unfortunately, it did not work for me. The workaround is to install VMware vSphere ESXi 5.5 Update 1 and then either upgrade the host with vCenter Update Manager or install install ESXi 5.5 Update 2 for a clean installation. Many thanks to malabelle on VMware Community forum for suggesting the workaround. just format the flexflash card and reset the flexflash controller .. It works smooth !!! I hit the same issue while installing ESXi 6.0. Any work around? You Can use fdisk also, as the partition is small just delete the partitions, reboot and thats it! You can erase virtual drive, that’s all. Get yourself a copy of the free gparted-live iso. map it to the host and boot with it. Select”enter the command line prompt” the run the following. ‘lsblk’ will list the available devices the flexflash card will normally be “sdd” then run the following ‘parted /dev/sdd mklabel msdos’ then run the lsblk command again to check it has worked. You should have no partitions. Mount you vsphere iso and reboot and you’re good to install. Technique is still working like a champ. Thanks! Worked also for me. Thanks! This is great, thanks. This works for UCS managed blades as well. Just dropping a note that Steve_c’s simple fix (in hindsight!) corrected my problem with 6.0 on flexflash within an M4 gen server. Reformatting with Gparted worked for me on my UCS blades, thanks for the suggestion! In UCS Manager the “Format FlexFlash” button was always grayed out. Gparted is a great tool, and in the past I’ve also used the Linux SystemRescueCD for blade server tasks also, works great! It works for me, after erase the virtual drive again from CMIC. I was able to get pat this using the ALT-F1 Technique and then using FDISK per this article. do a Fdisk -l to get the device name and substitute that device for the one shown in step 1 of the fdisk command. Thanks guys, especialy Nay Lin Oo. Your method is the easiest and fastest solution to the problem. I would like to say thank you too. Nay Lin Oo solution worked for me too. I was trying to install esxi6.5 and kept on failing with this error. I am also running CIMC 3.03. Erasing the virtual drive and enabling it again got it working. The only thing that I find annoying is that the flex flash takes a long time in the beginning to fully load. and nothing tells you that the drive is enabled. Either the host can see it or it can’t. Thanks Nay Lin Oo, you are the best! I just had to use fdisk and delete the win95 partition, write the new partition table (with no partitions) and it then installed ok. I had thar same issue. I just installed ESXi 6.7. I had to do ALT+F1 and delete the default HV partition on the SD Card using partedUtil tool.